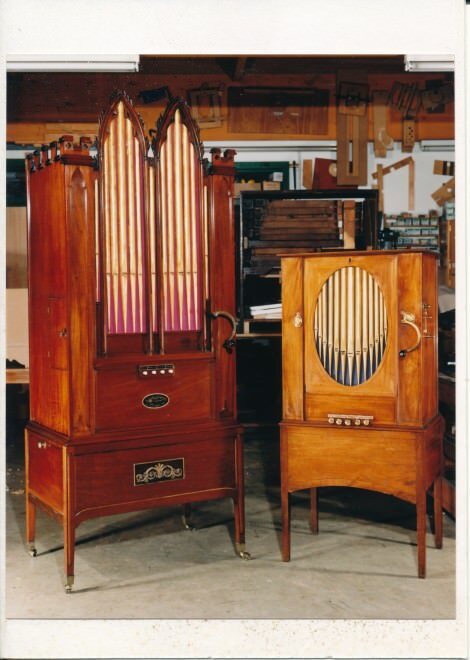 On the left of the picture is the barrel organ belonging to Tony Clayton, evidently a domestic instrument for a clerical gentleman, with sacred songs and tunes. This organ was made by John Longman in about 1805 (according to a label on the barrel). It has 21 keys. It had originally 3 barrels (with 10 tunes each), later expanded to 4, but only one survives. On the right of the picture is the organ belonging to the late Irene, Dowager Lady Astor of Hever, a domestic instrument with popular tunes of the day. It was made by George Astor, her husband’s ancestor, in about 1810. It has 15 keys. It has 3 barrels with 10 tunes on each.